You can review, manage and pay your bill anytime, anywhere by visiting myPIDBill.com. We've created this page to provide an overview of your bill so you'll know exactly what you're paying for and what to expect. 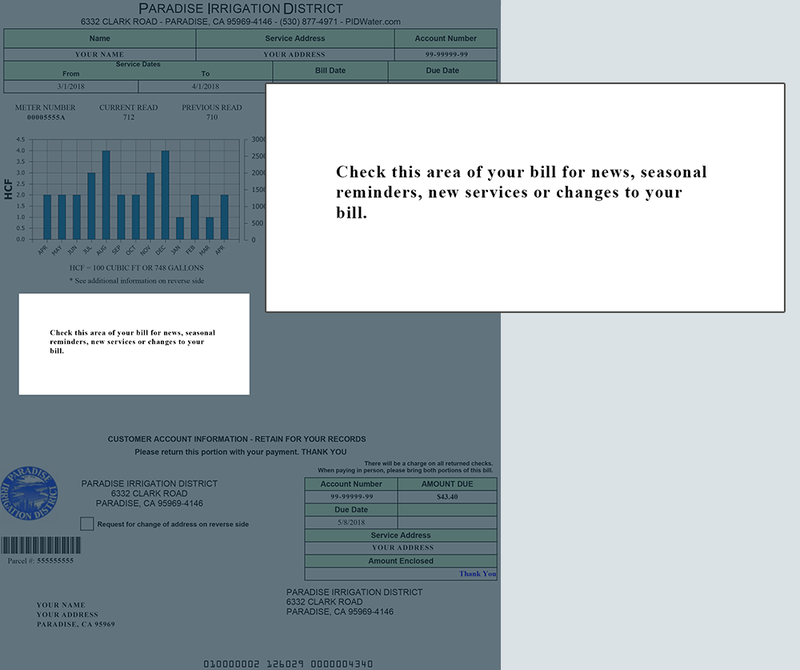 The bill summary box shows you just the basics of the bill. Due Date is the payment due date for the current billing period. Amount Due is the total amount due including current and past due amounts (The text here will read "CREDIT BALANCE" if nothing is due). * Important - Any unpaid or past due balance is due immediately. Service address - The property where water service is received. Amount enclosed - Space for you to write in the payment amount you're sending. The top of the bill shows relevant dates for this billing statement. Service Dates - This is the billing period for this bill. Bill Date - The date PID printed and mailed this bill. 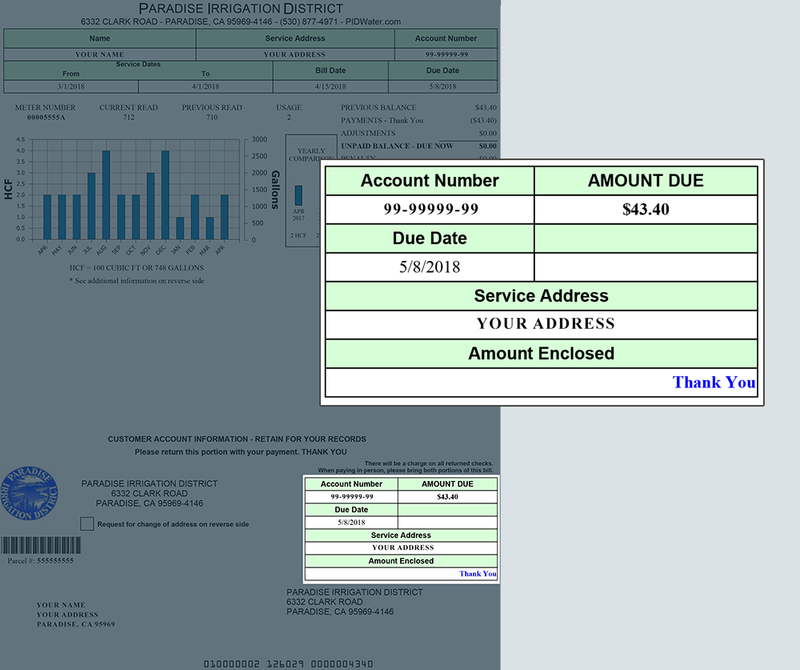 Due Date - is the payment due date for the current billing. The consumption portion of the bill shows the current and historical water use for this account. Current Read - The meter read on the day the service period ended. Previous Read - The meter read on the day the service period began. 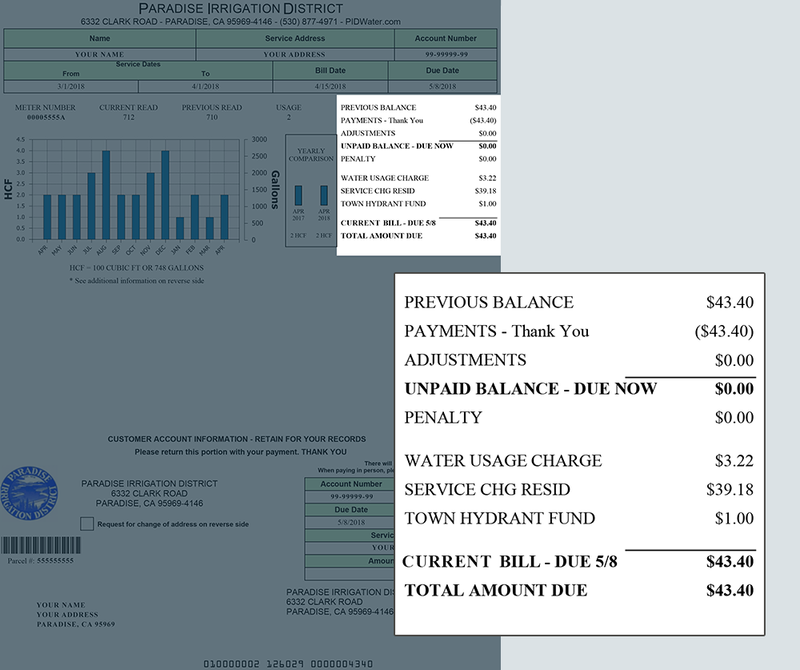 Usage - The number of units of water used during this billing period. One unit = 100 cubic feet or 748 gallons. 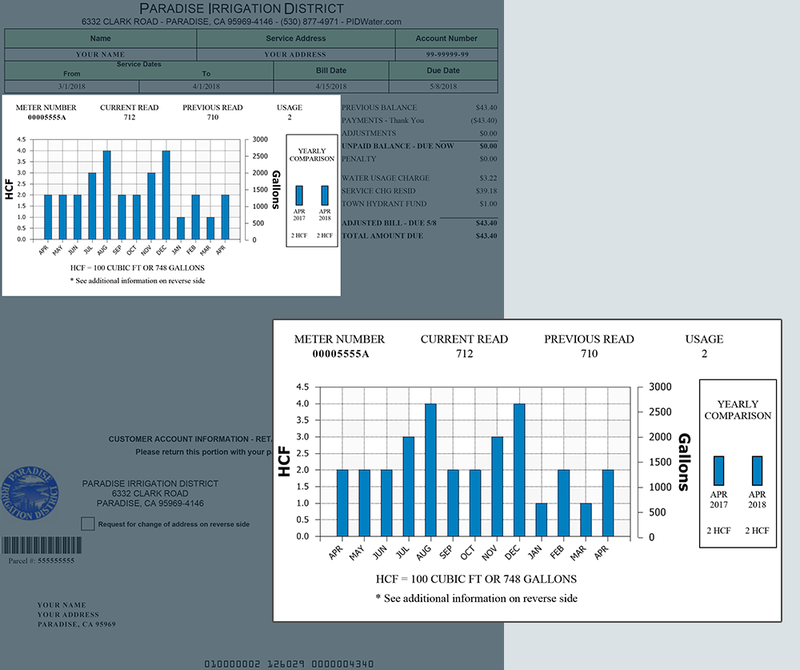 Chart - Shows water consumption history (in units and in gallons) according to billing month. Yearly Consumption - Compares usage on the current bill with the same period from last year. The billing details shows you all activity since the last billing statement. Previous Balance - The amount due shown on your previous statement. Payments - A summary of all payments received since your last statement. Adjustments - Miscellaneus fees or charges for additional services. Previous Balance OR Credit Balance - The past due (or credit) balance (if any) on your account as of the bill date. Penalty - The late payment penalty applied to the previous balance. Water Usage Charge - Charges for the USAGE on this statement. As of January 2018 the consumpion charge is $1.61 per unit. The service charge, reserve surcharge and debt surcharge stay the same each month. As of January 2018, the monthly service charge for residential service is $39.18. Serv Chg "Type" - The portion of the service charge based on account type. Click here to view rates according to service type and meter size. What does the service charge include? Reserves - A portion of the service charge the district places into reserve funds. pdf Click here to view the district's reserve policy (352 KB) . Debt - A portion of the service charge collected to pay for past, current or future projects such as the treatment plant, tanks, and the water distribution system. Click here to see current projects. Town Hydrant Fund - This amount is collected each month for the Town of Paradise. The amounts collected are used for fire hydrant maintenance and projects that improve fire fighting capabilities. Click here to read about the Country Club Road pipeline project - just one example of the types of projects supported by this fund. 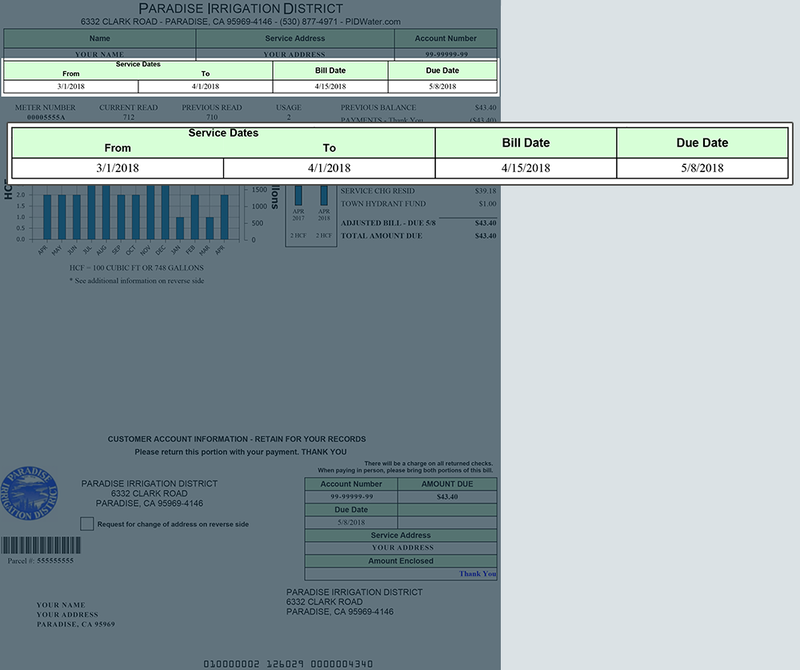 Current Bill - The amount due for the current billing period. Total Amount Due - The total payment amount due including current bill, previous balance, penalties, and and other miscellaneous charges. Read this section of the bill each month for important messages about the District, changes to procedures, price adjustments, legal notifications and more. Return this slip with your payment if paying by check or money order. Please do not mail cash. 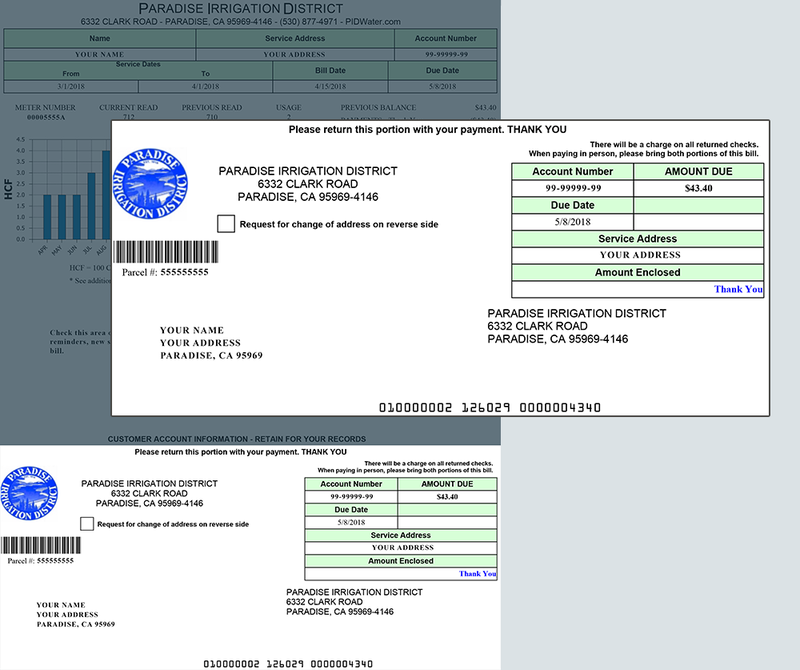 Cash payments may be made at the main office - 6332 Clark Road, Paradise, CA 95969. Be sure to write in the amount of your payment in the Amount Enclosed section. Note: Don't forget to write your account number on your check or money order.